USGA: Rate the Red Tees For Men! Earlier this year, the USGA and the PGA of America had a campaign to encourage golfers to play from the set of tees that are appropriate to their level of skill. I hope it went well, because the whole point was to make golf more fun and easier to play. What few male golfers know is that the right tees might be the red ones. For years, the red tees have been called the Ladies’ Tees. They’re for short-hitting women. This needs to stop, or rather, become more inclusive. There are some short-hitting men out there, too. In general, if you can’t drive the ball more than 200 yards, you should be playing from the reds. The other tees present a course that is too long for you. Even if you can hit the ball farther than 200 yards with a driver, but are pretty wild with it, you can play from the shorter tees, hit something off the tee that will keep the ball in play, shoot a better score, and . . . have more fun. But some (actually, many) men feel that their manhood would come into question if they played from the red tees, even if they are hacks from the next set longer. Their loss, I’m afraid. There is another reason why men won’t play from the red tees, and that is there is no course rating for men, at least as far as I have ever seen. Look at the scorecards of the courses you play. There will be an M and L rating for the white tees, maybe the blues, but the reds only have an L rating. That means if a man plays from them, his score can’t be turned in for handicap purposes. It’s not that playing from the red tees will make a 90-shooter a scratch golfer, either. It might lower their score by four strokes. You might get the ball up the green quicker, but you still have to get the ball in the hole. The red tees make the game easier, but not that much easier. I know. I play from the red tees with my grandson, and I shoot only two strokes better for nine holes than I normally do. And, having only an L rating perpetuates the myth that the reds are “Ladies'” tees. Look right there on the scorecard — L for ladies. What could be plainer? So I’m calling on the USGA to encourage local rating organizations to establish course ratings for men at the red tees. If this body wants people to play from the right tees, then all barriers need to be removed, and this one is in the USGA’s purview. I’m even thinking of forming a committee to rate the red tees for men as soon as I can think of a title that lends itself to a catchy acronym. In the meantime, if you want to have some fun, play a round from the red tees. You’ll hit different clubs, see a different course, and shoot a lower score, which is always good for the ego. After years of frustration trying to hit a metal driver, I pulled my old wooden Wilson 4300 2-wood out of the bag I keep old clubs in down in my basement. It’s the club I teed off with, quite nicely, for several decades before I decided it was time to get modern. I live next to a huge field that is used as a parking lot for our state fair. Two weeks out of the year it is filled with cars. Fifty weeks out of the year it is great for hitting golf balls – 600 yards long and 200 yards wide. There is O.B. but I defy you to hit one out. I took three balls this morning, a few tees, and the 50-year-old club to the field and hit a few. It was like going home again. The soft feel of impact, the gentle click of the ball, and the flight? OMG! Up in the air, straight, hang time to die for. Controlling this club is easy. 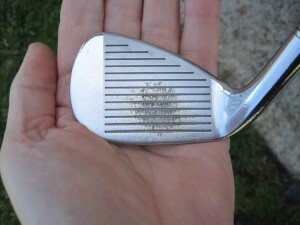 The small head doesn’t seem to have the same wind resistance during the swing that the larger-headed metal driver does. The steel shaft (42½”) gives me a uniform feel with the rest of the set. The best thing is I don’t lose one yard. In fact, because I can get the ball in the air, I might actually be gaining yards. The extra loft contributes to that last part, I’m guessing it has about 13 degrees of loft, whereas my metal driver has 10.5. I’ll have to have it checked on the loft/lie machine at my driving range. Hit it on the screws and you’re good to go. There actually are screws, too. Sometimes older is better. Sorry, Titleist, it’s to the basement with you. Last weekend, Lexi Thompson showed the LPGA that she is ready, as a player, to compete and win. She led wire to wire in her five-stroke victory in the Navistar Classic in Prattville, Alabama. She was never seriously challenged because she did not allow anyone to come close. If there is anything she lacks, I’m not sure what it would be. Her size and strength make her the biggest hitter out there. She has touch around the greens as well. The only question is how well she can stand up to week-in, week-out competition, or whatever the LPGA schedule can muster up that approaches that. That’s the only question about her playing ability. There is a big question about her even playing. Should she be able to become a full-time member of the LPGA Tour at 16 years of age, or next year at 17? So it can be done. Aree Song became a member at age 17 in 2003, as did Morgan Pressel in 2005, and neither were any worse off for it. There also seems to be a requirement for her to go through Q School, even though she has won on the Tour. There isn’t much sense in that, and Mike Whan, the LPGA Comissioner, has the authority to waive that matter. We might know in a few days. The only thing I would be concerned about is Thompson’s education. I believe a younger player must have received an accredited high school diploma to be eligible to apply for LPGA membership. The word “accredited” refers to the document awarded by a secondary school that provides a curriculum meets the requirements of the regional education accrediting agency. The diploma must also meet the standards for all public high schools of the state in which she lives. I could, at this point, launch into an essay on the value of an education, but do I really need to? Get the diploma, the right one, then go play all the golf you want. Golfers want to hit good shots. Shots that take the ball where they want it to go. Sounds pretty obvious. The mistake golfers make is in not focusing on the result of the shot is putting the cart before the horse. 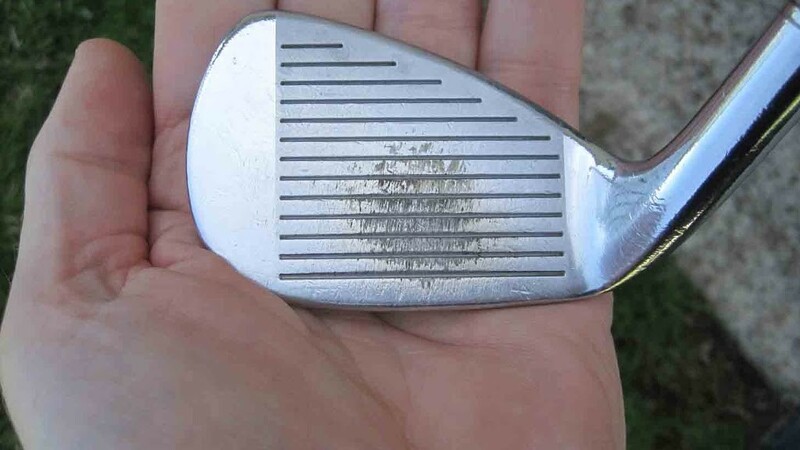 What golfers must be concerned about, perhaps the only thing they should be concerned about when it comes to ball-striking of any kind, is clean contact. There is a virtual instant, 5 milliseconds, 1/2,000th of a second, in which the clubhead is in contact with the ball. Geometry of the point of contact and the speed of contact is all there is to hitting the ball. The lessons you took were all designed to increase your chances of getting the correct geometry in place to that you could hit a shot you could play with. Let me say this in a different way. Once I thought that my goal was to be able to hit the ball straight on command. Now I believe that my goal is to put the clubhead on the ball the same way and in the correct alignment. Making that conceptual switch has made all the difference in my improvement. This is the 9-iron that belongs to one of the pros at my range. Get this by slowing down your swing until you are hitting the ball off the center of the cubic. It’s that easy to do. Just slow down. Don’t worry about losing distance. The center of the clubface is Distance Central. If you’re willing to work at it like this, and it will be work, then you will be able to play boring golf — drive, iron, putt, putt (repeat seventeen times). 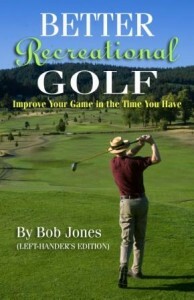 My new book, The Golfing Self, now available at www.therecreationalgolfer.com. It will change everything about the way you play. Yesterday morning I was at the range. The assistant pro and I were on the putting green. We got to talking about this and that, and the conversation got into the time when he was an aspiring tournament player. In comparing the difference between his game now, and what it was at that time (he was +4), and he is still a young man, he said it came down to two things: desire and focus. There was a time when he was practicing and playing every day, because he had the desire, and all that time with a club in his hand gave him the focus to play his best every time he hit a golf ball. That’s what it took to be good on professional terms. It seems to me, that’s what it takes to be good no matter what your goals are. Probably none of are going to become +4 handicap golfers, much less scratch or even single-digit. Talent aside, we don’t have the time. But to become the good golfer we wish to be, we must have the desire and the focus it takes to get there. If you have that, no matter how much, or how little, time you have to practice and play, you can get the most out of it. Quantity of practice counts, but the quality of your practice is just as important. You could start with practicing at home. There are always spare moments you can devote to the part of the game that is troubling you, and just a little practice, frequently done, goes a long way. A two-hour trip to the range once a week is enough time to practice everything – putting, chipping, pitching, and your swing. If you can practice more than that, even better. The important thing, though, is to apply desire and focus to your practice throughout the session. That means you practice because you want to get better at golf, not because practice is an enjoyable way to spend some time, or some such reason as that. Your motivation for even picking up a club is that you want to get better. Being focused means that every time you hit a golf ball your mind is fully engaged on what you’re doing. If you have ten golf balls, hitting every one is a unique event. There’s no hitting the first one and doing that again nine times. Every time you address a new ball you start over, with your grip, your setup, and especially with your mind. 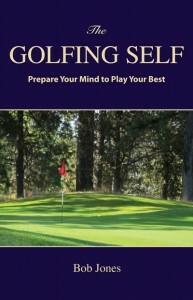 In order to play your best golf, your mind must be in the right place as you hit the ball. Practicing that is every bit as important as practicing your technique. If you’re practicing technique, by all means, take as many practice swings as you need to be satisfied that you’re doing it right. But when you step up to the ball, your mental task is to let go of any thought of technique and let your habits take over. A major part of any practice session it to practice having total confidence in what you have trained yourself to do, from address to follow-through. That’s focus. It’s hard to come by unless you practice it. If you do, you will get the most out of what you have learned, every time you play. To learn that focus, well, it’s hard work. You have to want to. That’s desire. Put those two together and you’ll be a good golfer — one who gets everything out of his or her talent and technique, regardless of the score that gets made. Everybody wants to have a long putter these days. Adam Scott has one. Webb Simpson has one. Keenan Bradley has one. Michelle Wie has one, though it didn’t help her with a two-footer she had last Saturday. Good grief, even Phil Mickelson played with one in a pro-am. Who’s next, Brad Faxon? Loren Roberts? Me? Actually, I bought a belly putter about seven years ago. It’s 42 inches long with a split grip. The trouble is that I’m 6’6″ tall, and this putter doesn’t even come up to my waist. I putt pretty well with it, but I like my old Bulls Eye better. So just like Rory McIlroy winning the U.S. Open means he is going to win every major for the next eight years (or so the golfing press would have us believe), Keegan Bradley winning the P.G.A. with a broomstick putter, and Webb Simpson winning twice with one, means that everyone is going to switch. I think it’s little early yet to say that. Both of those things. What people are making noises about, though, is whether long putters should be outlawed. I guess it’s OK with the purists to use one as long as you don’t win anything. This reminds me of Sam Snead and the croquet-style putting stroke. Snead, who had the yips real bad, got the idea for Bob Duden, an Oregon professional who adapted a putter so he could putt straddling the line of the putt, and facing the hole like he was playing croquet. This was OK until Bobby Jones saw Snead was putting that way at the Masters. In short order the USGA said, No. (I’m surprised we still don’t have the stymie. Jones loved that, too.) The rule that you can’t straddle the line of your putt (16-1e) was adopted to kill croquet putting. Sam tried to get around it by putting side-saddle, but it wasn’t the same. Croquet putting just wasn’t golf, what ever that means. People are saying the same thing about putters long enough to be anchored to your body in stead of being held exclusively in your hands. It’s just not golf. If some genius in the 19th century had come up with a croquet putter, would it be golf now? The chest putter has to be anchored to your sternum during the stroke. If the end is moving around, you don’t have a chance. I say, if the long putters are banned, (and they probably won’t be) then let’s go back to wooden woods and wound balata balls. Or wooden-shafted clubs, to make Booby Jones’s spirit happy. But until some long-shaft putting pro starts averaging 25 putts per round, enough with the sour grapes. I have two sets of irons, both of which include a 2-iron. Since those clubs aren’t even made anymore, unless you special order them, you can tell how old my clubs are. Hardly anyone plays with long irons anymore. Even if they weren’t hard to hit, you have to have a decent swing speed to get the distance out of them that they’re supposed to deliver, and that speed is faster than most recreational golfers, including me, can bring to the table. When I replaced my long irons with hybrid irons, I didn’t get rid of them. I like to keep sets of things intact, because you never know when something you don’t use anymore can suddenly become useful. This week my long irons became useful. This summer has been devoted to getting into condition for a hike across the Grand Canyon — down from the North Rim and out to the South Rim. You don’t have to be in world class shape to do that, but the preparation is tough and doesn’t leave a lot of energy left over for much of anything else. Consequently, I haven’t been playing much golf. I’ve played three rounds since April, but I’ve been working on the release that I learned back then, and my short game a lot. The hike will take place in the last week of this month, so I’ve started going to the range in earnest to be able to play my best after I get back. It’s in these sessions that I discovered a good reason to haul out my long irons again. That reason is, in order to hit a long iron well, you have to be doing a lot of things right. Quite frankly, you can get away with murder and still hit a 9-iron pretty well. But a 2-iron? A 3-iron? There’s no room for doing anything but the right things if you want to make clean contact and send the ball off long and straight. Part of my practice plan is to hit 10 shots with the even-numbered irons on one day, and the odd-numbered irons the next. So I challenged myself by taking out my hybrids and putting the long irons back into the bag. I knew I had to lead the club into the ball in just the right way and deliver the clubhead in just the right way to have any chance of getting a good shot out of the swing. The results were fabulous. With the new release, and a few other adjustments, I hit them supremely well, so well that I might be tempted to go play with them. Alas, I won’t, because I’m a too-slow-swing-speeder. Their role from now on is “practice club”, but it sure is nice to be able to hit one and watch the ball fly off just like it’s supposed to. I didn’t stop there, though. That swing was so right that I thought it had to be the swing to use for the other clubs, too. Since today was odd-iron day, I went back down through the 5-, 7-, and 9-irons with that 3-iron swing. I got great results, better than with the swing I had been using. This might not be a perfect golf swing, but it’s pretty close to one. That’s the real value of taking your long irons to the range. You’ll find your swing, and if you have the discipline, you can carry that swing throughout the bag and hit the ball much better than before. You’ll hit your wedges a lot better with that swing, too. I think Tom Watson does this. He hits his 2-iron only at the range, but it’s to make sure that his swing is working the way it should. I’ve written before about building your swing on your wedges. But maybe I got that backwards . . .
2013 update: To hit long irons well, get the off the ground and have them go a reasonable distance, your hands have to lead the clubhead into the ball. To be in control of your swing, you have to be in control of the clubhead at all times. Take a backswing that is only so long that you can still be aware of where the clubhead is. It’s like pounding a nail into a board. You’ll take only a short stroke with the hammer so you can hit down on the nail squarely. With a longer stroke you would lose the connection between the hammerhead and the nail. You’d have to “find” the nail again as you swing down and would seldom to it right. In the same way, you should swing a golf club back only so far that you still feel a connection between the ball and the clubhead. If you swing back farther than that, the ball is essentially lost, and the chance of good contact is diminished. Try this. Take the club back until your hands are at about an 8 o’clock position. At that point, you can feel exactly how the clubhead will come into the ball. The swing is small enough so that you feel complete confidence that you can make the clubhead meet the ball squarely. That’s the feeling you want to have all the time. Make more swings, taking the clubhead back farther and farther until you lose that confident feeling. That is a step too far. Shorten your swing so you get that feeling back. That’s it. Don’t ever take the club back any farther than that. After a certain point, taking the club back farther doesn’t do you any good, and probably makes things worse. This might be a shorter backswing than you’re used to, but that’s all right. It’s farther back that it feels like. Don’t worry that this shorter swing will cost you distance. Because you’ll hit the ball more solidly, you won’t lose any, and might get more. What I talked about is taking the club back only so far as you can still sense where the clubhead is. That does not mean that you restrict your turn. Always turn fully, that is, turn your upper body to the point where your back faces the hole directly. You can restrict your arms, but never restrict your turn. 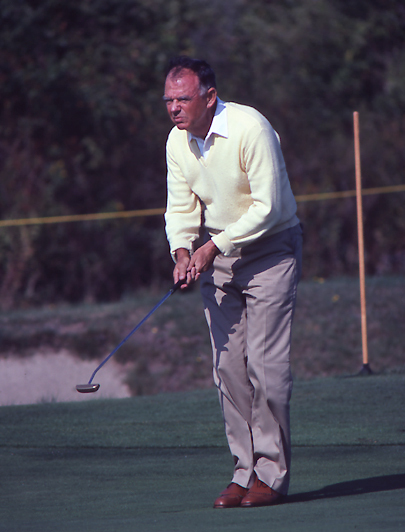 Paul Harney, a stalwart of the PGA Tour in the 1950s and 60s, died last week at the age of 82. He won six tour events from 1957 to 1972, and finished fourth in the 1963 U.S. Open, missing the three-man layoff by one stroke. In the 1960 Open, he was Arnold Palmer’s playing partner for the final 36 holes of Palmer’s historic victory. Harney played full-time on the Tour for only seven years. Once his children started school he became a part-time player and full-time club professional. He had four top-ten finishes in the Masters, finished seventh once in the PGA, but never played in the British Open. For those of us who remember, Harney was one of the players who created the face of professional golf in that era. For me, he represents the time when I started to play the game and follow the Tour. I was a wonderful time, and thinking of him takes me back. My condolences go out to the Harney family, who had the privilege of long association with this great man. Everybody wants to shoot lower scores without working that hard to do it. Why wouldn’t they? 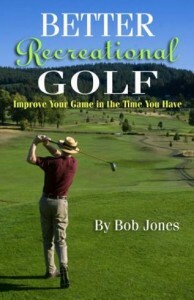 Most recreational golfers have busy lives that leave them barely enough time to play, and even less for practicing. Here are ten easy ways to shoot lower scores in the time you do have to play and practice. 1. Off the tee, play a game of Get the Ball In the Fairway. That means keep your driver in the bag unless you’re sure you can hit the fairway with it. Most of the time, you don’t need the extra distance the driver gives you. In fact, leave your driver home one day and see what happens when you’re hitting your second shot from the short grass more often that you might be doing now. 2. 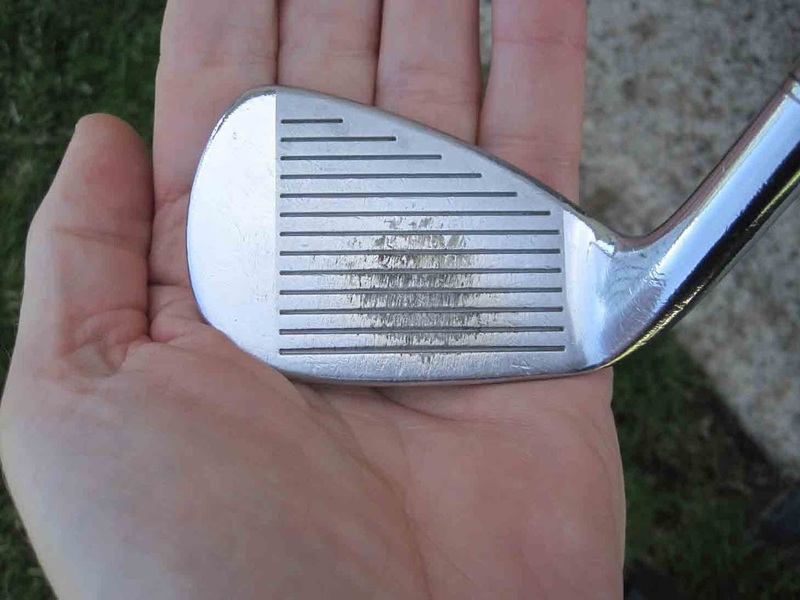 Work real hard at making good contact with your irons. If you do, straight shots follow. Hitting fat, and most recreational golfers do hit behind the ball, is the major cause of poor iron play, not slicing or hooking. Learn to hit the ball first, the ground second. 3. Your short game goal is to get the ball on the green and reasonably close to the hole. Don’t get cute. Just get the ball on the green with your first short shot so you can start putting. 4. Practice approach putting a lot. More 3-putt greens are caused by leaving the first putt too far away from the hole than by missing short putts. 5. Always feel good about the shot you’re about to hit, especially around the green. If you don’t, then pick another shot or a different club. Having full confidence in what you’re about to do is a critical golf skill. 6. Never give up on a hole. You can still make par even with a mediocre shot or two, or even one bad one. 7. Get real good at letting go of the past and not getting ahead of yourself. Never berate yourself when you hit a bad shot and never moan over having to play the next one from a less than ideal place. Never think farther ahead than the hole you’re playing on. 8. Don’t think about the score until the round is over. If you’re playing poorly, thinking about your score makes things worse. If you’re playing well, you’ll cut yourself off from the frame of mind that got you there. 9. Don’t rush to judgement about which shot you are going to hit, or to where, or with which club. Take a few extra seconds to find the right option. If you do this with a calm mind, the right option for you will become clear. 10. If there’s a hole in your game, get a lesson to get it fixed. Most golf shots are easy once you know the secret. The pro will show you simple things in fifteen minutes you would never figure out in a million years.